File this under: "She can dish it out but can't take it." Among other things, the fake interview has Amanpour claiming that "Pharmaceutical, oil, liquor lobbies, (and) huge financial institutions" are dictating the extent to which CNN is covering the Turkish demonstrations. I suspect that very few Turkish readers could be so foolish as to believe that, even if they didn't get to the bogus report's disclaimer. Amanpour is familiar with irony or saracasm, but her execution of the technique leaves much to be desired. 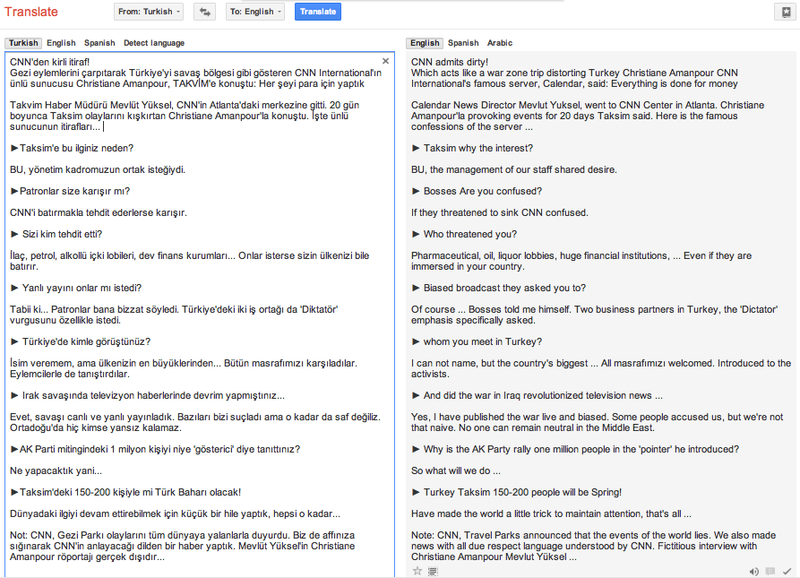 Unlike the clearly labeled satirical Turkish report, there was absolutely no reason to believe that Amanpour was kidding. After all, she has given terrorists, communists, and dictators quite a bit of deference during her career, and she works for a network which admitted to censoring itself in Iraq for at least a decade between the two wars in that country so it could retain access to dictator and mass murderer Saddam Hussein. Amanpour pulled the Mugabe tweet, which was not labeled as irony, and replaced it with a different one while claiming that she meant to express "scorn" all along. Uh-huh. The obviously bogus report's Turkish author is defending himself: "Hi Christiane, I am the reporter of the fake interview. Do you really think it is true... It's just sarcasm." To be clear, Takvim does not appear to be a model of journalistic integrity, and press freedom is a real issue in Turkey. But Amanpour's childish reaction to obvious sarcasm only makes such publications appear more credible.